Just when I think I've found them all, more Houdini art shows up. In this case, I'm looking for sculptures and statues. http://www.arspraestigium.com however their site seems to be suspended. There is no telling what that means, it's the internet, so maybe their site was hacked, who knows. 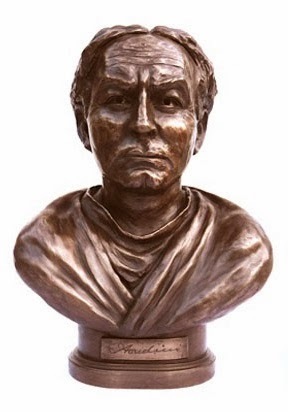 But the bust is an interesting one with Houdini in a straight jacket. As I recall, the site offered some other busts of famous people, like Sir Arthur Conan Doyle. But with the site down, I can't go back and check. Hopefully, it will be back up again soon. This is cast in resin and comes in two different finishes. It stands a whopping 21 inches tall. The website says it is limited to 100 busts and it also says the first run sold out. So maybe they are doing more than 100, or they cast less than 100 to start. At any rate, check their website for purchasing info. similar but they are in storage. 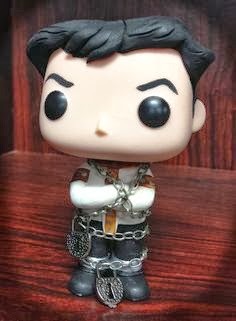 I have no idea who made these and I'm sure they are no longer for sale. 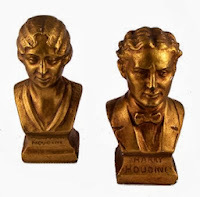 But they are an interesting addition to the Houdini bust collection. There is an amazing sculpture and article featured over at HoudiniMuseum.org that you must go check out. There are several photos of the piece created by sculptor Mel Zapata. It's a truly striking piece of Houdini art. The final one today was featured over at WildAboutHoudini.com. It's a sculpture by artist Victoria Mock. The piece has Houdini in a straight jacket sitting on a box. It's quite cool. 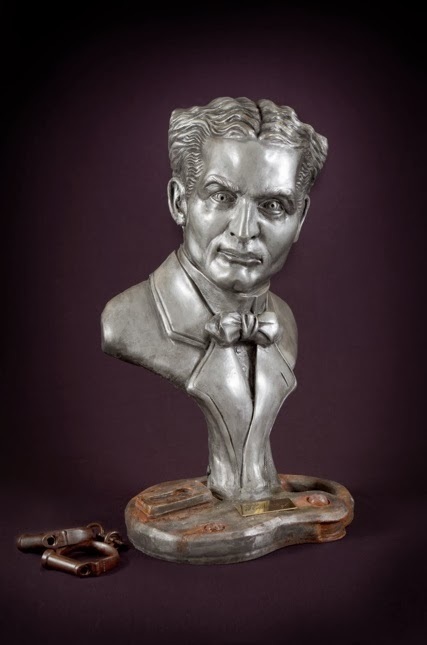 If you want to see more Houdini art, check out some of the past articles on the Houdini Busts. I'm sure I'll be back with more! Please note that our Houdini Bust, by Artist Peter Close, as well as other Houdini sculpture items, can be found on the Ars Praestigium (MagicArtShop.com) site. Thanks for sharing these images, you've accumulated a very nice collection here!